Tapestry of Grace can be overwhelming to someone just starting out on the journey. There are ways of keeping your weeks light and custom fit to your family and its unique focus. 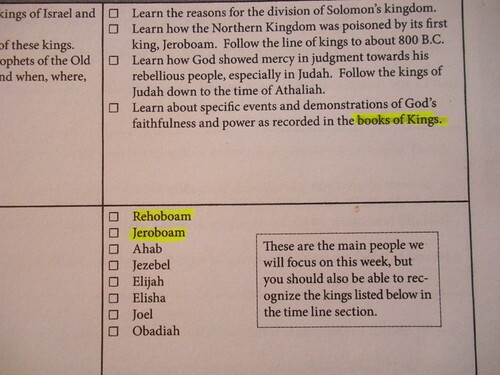 Using notebook pages in our homeschool high school has helped our family stay on track and to keep from being buried by the possibilities offered in the Tapestry of Grace plans. I am a firm believer in the process of real learning: read, ask questions, read some more, write about it, and then discuss it. Of course this is a learned process and I certainly never expected it from my children when they were younger but now that they are in high school I definitely expect them to be able to work this way. It makes them own their knowledge. Over the years I have depended less and less on the Tapestry of Grace blue activity pages and charts. I realized that by having my boys use those preplanned questions, hoping for the “correct” answer, I was cheating them of being part of the process of finding out what is most important. Using notebook pages gives them a little freedom to ask themselves questions and then share in their written narration just what they discovered about their reading for the week. We meet on Fridays to discuss their week’s work and I read their notebook pages to see what they are gleaning from their studies.More often than not, they surpass my expectations. If I think they have missed something important, we discuss it at that time. At the beginning of each school year I sit down to decide which subjects we will need notebook pages for as we work through our courses. This is a step you will use even if you don’t use Tapestry of Grace. Some subjects we keep notebook pages for include the following: History, Biographies, Literature/Authors/Literary Terms, Geography, Artists/Composers, Presidents, Timeline, Bible/Religions, Government. Since we do not have quizzes at all and very few tests in our high school courses, I use the notebook pages as a personalized record of each boys’ work each term. Next, turn to the first yellow Overview page and skim through the material there and highlight any additional ideas you wish to emphasize. I look at the people and timeline lists and make sure we are going to hit the highlights. At this point you are ready to decide on notebook pages for the week. I have all the tables of contents pages from every notebook set I own printed and filed in a binder for reference. I pull my binder out and turn to the appropriate categories. I choose one or two pages for each topic I have highlighted from my Tapestry of Grace plans.You can see my notes written with dry erase markers on the sheet protectors. I marked the week number for the pages we used from this set. You can see this is not a complicated process if you keep it simple. If we are finishing a literature book, I make sure to print out an author biography page to complete for that book. 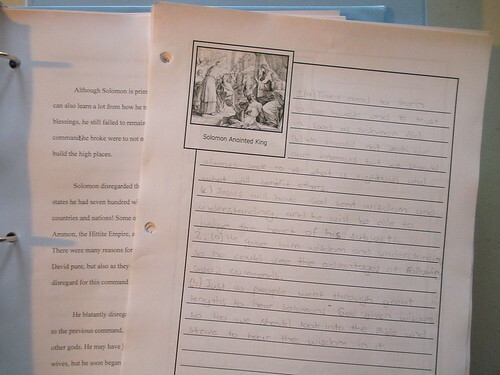 We use notebook pages to keep written narrations from the week’s reading. 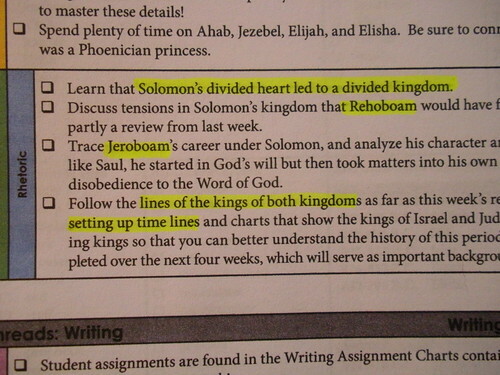 These notebook pages many times then become the basis for more formal writing assignment like this one on King Solomon. Sometimes there is not a premade notebook page that fits a topic we have in mind. Most sets of notebook pages come with a blank customizable page at the end of the set. You can also purchase a set of basic notebook pages that you can add images or sketches to for a perfect fit. If you would like to see some more of our high school notebook pages, you can click over to my Notebooking for High School page on Squidoo. 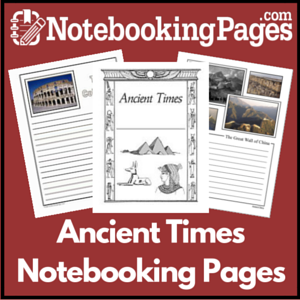 You can also click the notebooking tab at the top of my blog if you want more details for many, many sets of pages we have used over the years. 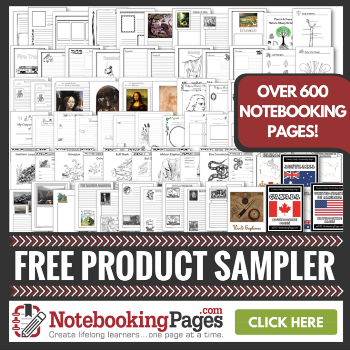 Hope you found this information helpful….I wish I would have had a better system when I started using notebook pages. This is the best deal in town on 1000’s of notebook pages. I highly recommend purchasing a Treasury membership from NotebookingPages.com. Hooray! I love seeing the practical applications of TOG in action. And for the permission to use notebook pages rather than the supplied TOG ones. Thanks for coaching me towards the high school years. Now and next year, 8th grade are our learning years in prep for high school. My oldest two are just a year apart in grade and I often teach them together. Another very helpful post — thank you! Especially since I am considering TOG for next year! This is fabulous!!! Thank you so much. This is our first year using TOG and this post is just what I needed. I love TOG, but sometimes feel like I we are just skimming the surface. As a bonus, I already own all the History Scholar pages- so yeah for me!!! We are going to be starting TOG this next year and I’m very excited. I would love to incorporate notebooking too but I have a couple of boys who I’m afraid will absolutely abhor the writing part. One will be 7th grade age and one will be 3rd grade age. (I also have a daughter in between who will have no problem with it.) Any suggestions on how to work into TOG with narrations and notebooking at those ages? We really haven’t done a lot of either one so far. Barb, even though this is geared towards the Rhetoric level, I love reading how you choose your Notebooking Pages. We used TOG (Yr 1) for the first time this year with my first grader. We read a ton of books and made even more crafts and it quickly became our favorite subject. I’ve discovered Notebooking in the past 6 weeks or so and we’ve only completed a few history-related pages so far. We’ll start Year 2 in late July and I plan to incorporate Notebooking since my son loved it so much. I appreciate the way you outlined how you utilize both NBing Pages and TOG.